Aizawl, April 11: Voting for the first phase of Lok Sabha Elections 2019 is currently underway for the lone Mizoram seat on Thursday. 55.20 percent voter turnout was recorded until 3 pm. At the Venghnuai polling station within Aizawl South – II assembly segment, senior citizens also came out in large numbers to vote. Six candidates are in the fray for the Mizoram seat and three for by-poll held at the Aizawl West – I Assembly constituency. Polling for the seats began today at 7 am and will end at 5 PM. According to data by Election Commission of India (ECI), Mizoram has 7,84,405 voters, which includes 3,81,991 male voters, 4,02,408 female voters and six others. Out of the total voters, 52,556 are first-time voters. A total of 1,175 polling stations have been set up across the state of which 117 are for women. In Kanhmun village situated along the Mizoram-Tripura border, fifteen special polling stations have been set up for 12,000 Bru voters lodged in the six relief camps in North Tripura district. Polling in all the constituencies will take place through Electronic Voting Machines (EVM)s and VVPAT machines which are placed at every polling booth. Here's how you can check your vote on VVPAT. 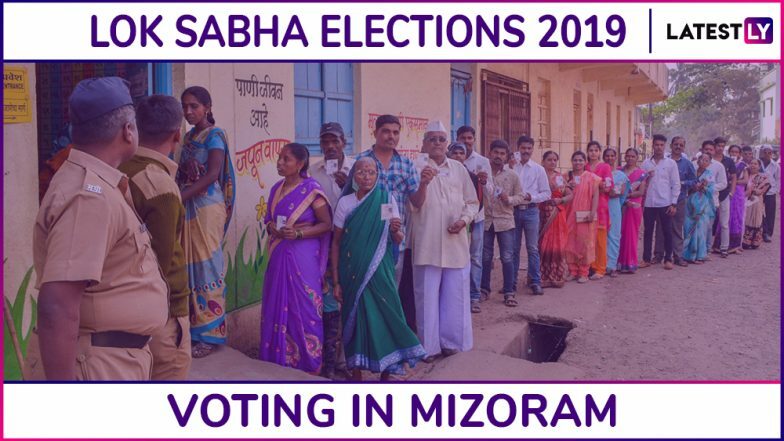 Mizoram Lok Sabha Elections 2019 Dates: Complete Schedule of Voting And Results For General Elections. The six candidates in the fray for the Lok Sabha seat include C Lalrosanga of ruling MNF, Lalnghinglova Hmar an Independent supported by the opposition Zoram People's Movement (ZPM) and the Congress, Nirupam Chakma of BJP, T B C Lalvenchhunga of People's Right to Identity and Status of Mizoram (PRISM) and two Independents Lal Hriatrenga Chhangte and Lalthlamuani. Mizoram Lok Sabha Constituency: Candidates, Current MP, Polling Date And Election Results 2019. In Mizoram, three candidates in the fray for the by-poll to the Aizawl West – I Assembly seat are Zothantluanga of the ruling MNF, Lalbuanga Sailo, an Independent supported by ZPM and the Congress and Rev Zaichhawna Hlawndo of the 'Zoram Thar' party. Voting for the Lok Sabha Elections 2019 is scheduled to be held in seven phases. The first phase of voting is being held today and the last phase will take place on May 19. In Mizoram, voting will take place in the first phase. The notification for elections to Mizoram Constituency was issued on March 18. The last date for filing of nominations was March 25. The scrutiny of nominations took place on March 26 and the last date for withdrawal of candidates was March 28. The counting of votes will take place on May 23.